The prompt this time was the five-word free write (for a description of this prompt, click here). I’m not really sure how it all happened. I got caught up in the fever of it, I guess: The World Series. 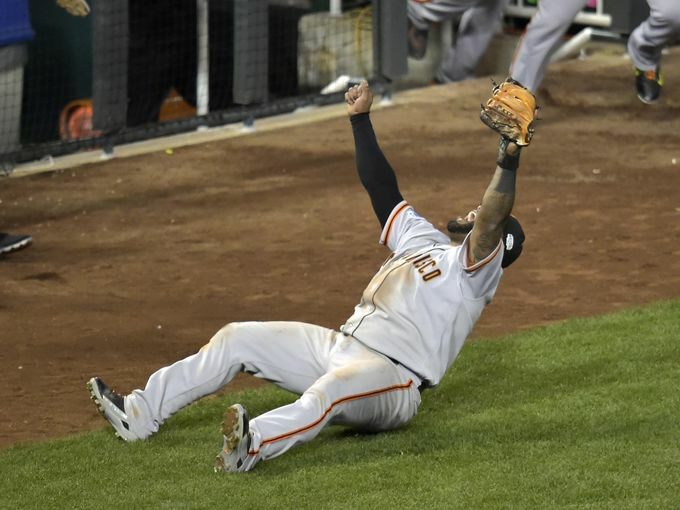 The geeky big boys on the SF Giants team. The sturdy, hopeful KC Royals coming back after twenty-nine years of losing, their blue uniforms, their Korean fan made world-famous after they flew him back for good luck. I don’t know how it happened; suddenly I just cared. I come from a family of jocks, but never really related to sports. Sitting around watching the TV on a perfectly fine weekend day makes no sense to me. For years I endured feeling like an outsider during baseball season. “I’m not really that into the Giants,” my sixteen-year-old nephew said, stretching out his long legs as we sat next to one another on my brother’s couch, my sister on the loveseat, the game bigger than life on the huge TV. “You’re right,” he said, then turned up the volume as we all took in the game. If I’m totally honest, my World Series fever really got kicked up once I met Juan Gomez and found out he was a Giants fan. Juan and I had kissed once on my way out of a dance club. It was one of those kisses, so I went home and promptly began stalking him on Facebook. After he accepted my friend request, a whole fantasy started to unfold over Facebook messages. “Can we meet at HiTops and watch a game?” I asked him, referring to the only gay sports bar I have ever heard of. “I’d like to buy you a beer and kiss you again.” And so began our epic cyber flirtation. But the next game was on an evening I had to teach. I prayed the teams would tie 3-3 so I could meet Juan for game 7. When my prayers were answered, I put on the only orange t-shirt I own and entered the bar just as Miss Thing hit that high note during the Star Spangled Banner. Juan texted just then and said he was stuck at work. Men. I knew right then and there that my Juan Gomez fantasy celebration kiss wasn’t going to come true, so I ordered a pint of Stella Artois and some garlic fries and texted my best gay pal. “Come save me from this plate of fries,” I wrote, sending him a picture of the big, greasy, delicious mess. He showed up twenty minutes later. The crowd dressed in orange and black thickened and roared. It turned out to be a very close game, but since Juan never showed up, I couldn’t grab him and scream when Sandoval (aka The Panda) caught the winning fly ball. But I cheered anyway, and hugged a few strangers standing nearby. I’m no sports fan, but something about the World Series that year had me feeling hopeful. 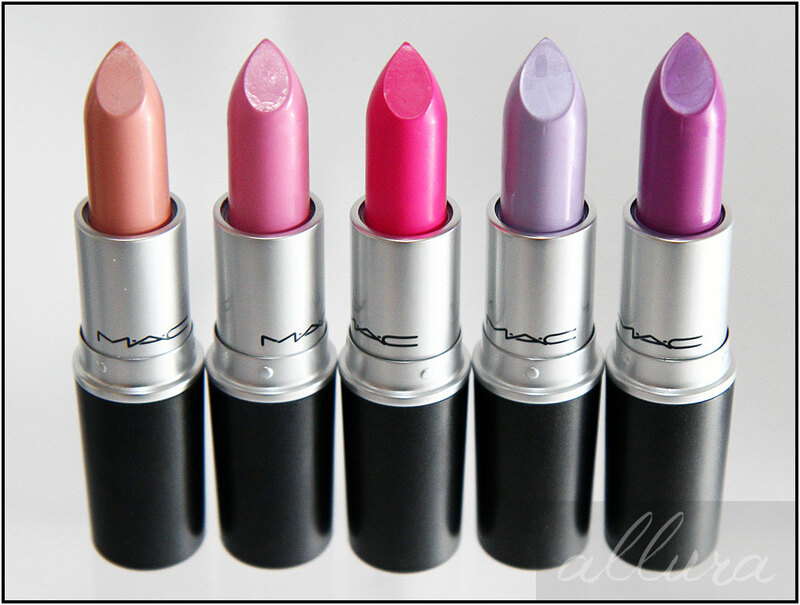 For this piece, I responded to a series of prompts I’ve always enjoyed: the names of lipsticks and nail polish. I have always wanted this job. A few of the names I have found are below. What I wrote follows. “You’ve got glitter on your cheek,” a friend told me recently. “I know,” I said. “Don’t try and get it off; I’ve tried. It’s impossible.” What I don’t say is that glitter is part of my under-eye concealer. Those are tiny reflective squares that make the light bounce back. What you call “glitter” is actually a sophisticated microlight enhancing system. It’s what makes people look flawless in photographs. Another friend recently asked if she was wearing too much makeup, to which I honestly replied, “No. You don’t even look like you’re wearing makeup.” She smiled. “I’m just wearing a little powder and some mascara.” She looked great. “What about me?” I asked. “Am I wearing too much makeup?” She studied me in a cool way. “I can’t even tell that you’re wearing makeup,” she said thoughtfully. “Are you really, or are you kidding me? “Just some concealer on under my eyes,” I said. “And a little sheer foundation on my cheeks.” We both laughed. As if it isn’t enough to come out as gay and a Madonna die-hard, now I find I’m coming out about wearing makeup. I’m a man who wears makeup. Why? Because I look better in photographs, that’s why. And as I age, I have found it becomes harder and harder to take a good photograph. Flash photographs are especially bad, but with makeup on, those magic little reflective squares marry with the bright light and POW! My face has a flawless moment. This all began when a friend became a makeup artist and—according to him—I was the perfect pallet. Once he finger-waved my hair and made me look like a beautiful Russian model: big eyes and pink lips. Another time, he took me to a Kylie Minogue concert; my lips were lavender and my false eyelashes silver. I looked like my mother might have looked if she had been born in 1980 in Australia and been a lifetime Kylie groupie. When we saw Moulin Rouge at the Castro Theater, he wrapped me in a red feather boa, gelled my hair off my forehead, and gave me rosy red lips and smoky eyes. He made me love the artifice in a way that was playful and theatrical, but he also helped me to see how a little can go a long way. When I arrived, my face naked and pale, the tiny veins on my cheeks and the shadows under my eyes clearly showing, he greeted me with a hug and took a good long look at me. “You look great,” he said. “Are you wearing makeup?” I shook my head. “You look great,” he said again. Love is blind, I guess. And much less critical than I am when it’s just me and the bathroom mirror. This recipe is another one from my forthcoming memoir cookbook. It’s for a simple, savory sauce that you can use on chicken or fish, or use as an alternative to salsa. The green sauce recipe was inspired by my visits to Puerto Vallarta and my friendship with Erick and Juan Carlos (click here to read my earlier story about cooking with these men). It’s simple and beautiful. I’ve also included a few writing prompts below as well. Enjoy. Everyone is more beautiful in Puerto Vallarta. Is it almost time to eat again? Te amo means I love you. Cut the peppers in half and remove the veins and seeds, then chop into small pieces. Dice the onion and sauté with peppers in olive oil over medium heat until very soft, about 20 minutes, then add butter and melt, mixing in well. 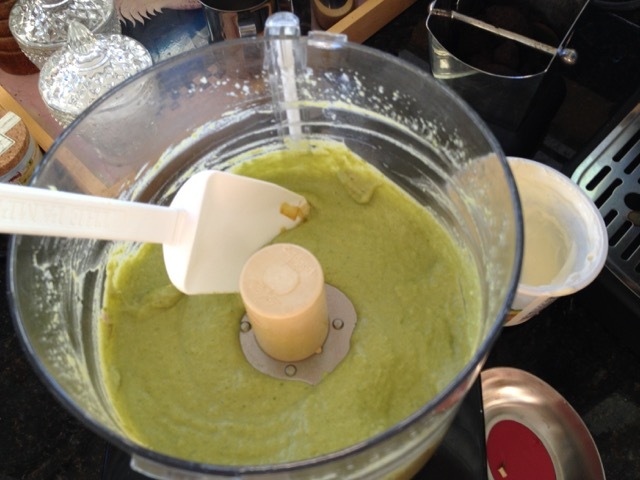 Add the sauté mixture to a food processor (a blender will work, too) and puree until smooth.